Windsurfing is for me, first and foremost, a synonym of freedom, which enables you to grow, evolve and be more in tune with yourself. I like people who are avid and eager to discover other things, things that are different from what they are used too. With people like this, you can have rich and interesting conversations. I don’t really know what to answer to this question, I am generally curious. I like questioning and understanding what surrounds me such as the human body, the importance of biodiversity, the climate, pollution and how I too could contribute in this world as well as the politics and the different cultures. 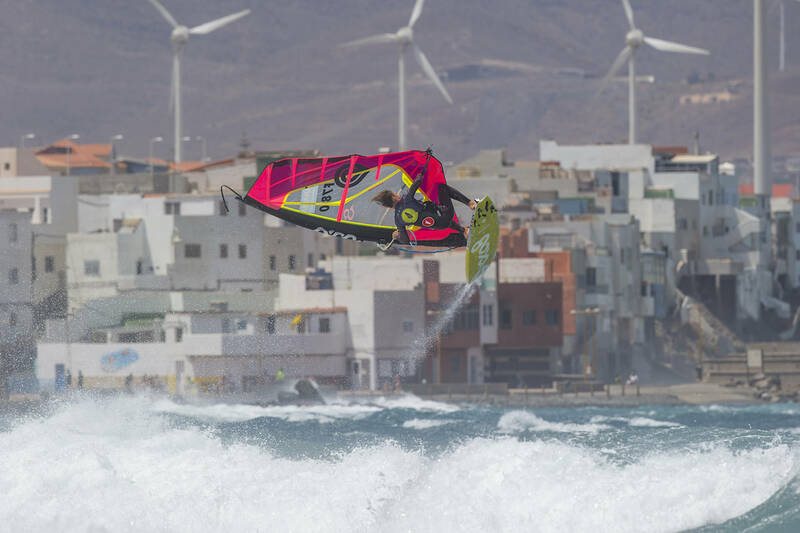 My best moment on tour, so far, was in 2015, during the trials, when I qualified for the first time for one of the event of the PWA in Pozo. It was my dream. The defeats are always painful moments, especially when your performances were not the best, but it makes you stronger and it’s part of the process. To be honest, I had a lot of chances that Goya Windsurfing started to offer me their help very soon (it has been eight years now). My gear was adapted, which helped me a lot. I was also able to travel and participate in the PWA junior and then the main PWA events. No matter what, to make progress and reach a high level, you need to train hard, be consistent and dedicated. Have fun and enjoy yourself first. My perfect day would be to wake up in front of a dream spot (side, side offshore, starboard tack), and have a great waveriding session. In my daily life, my perfect day would simply be to have a great time. Without a doubt my father. I don’t know myself enough to know it yet. But what really is a professional windsurfer? A rider that can correctly live from their high-level performance in sport. At the moment, it is not my case; that is why I have started to study osteopathy, a fascinating field. I am fortunate to have the ability to pursue studies in an area that I enjoy, but I have to find a way to make everything work. All the spots are good, but in the end it will depend on what you want to work on. If you want to improve your jumping skills in port tack, then you need to go to Pozo. If you want to work on your wave riding technique at a world-class spot, Ho’okipa is the spot, otherwise, I like my home spot, even if it would clearly be more interesting to travel the world looking for waves, but with the current environmental problems happening, the future does not look too good, we need to remain simple. Without a doubt, I would love to go to Chile and Australia even though they are port tack. If God exists, I would like to meet him, to tell him that here on Earth, things are not going well, even though I am part of the privileged. Instagram, even though I try to reduce the amount of time spend on platforms such as Facebook and Instagram as they are very superficial, and our society becomes more and more addicted to them. WindGuru to check on the wind every weekend. Thanks, Loïck. Good luck with your Osteopathy studies and see you on the water soon.